Begin by making the syrup. Bring all the ingredients to the boil and simmer for 20 minutes or so on a moderate heat. Strain through a fine sieve or muslin, squeezing every last drop out. Be careful and wear an apron as the mixture may splash and stain your clothes. If you have 200ml of juice, add 200g of caster sugar to the liquid (if you have 150ml juice, add 150g sugar, etc) and bring to a gentle boil on a moderate heat and simmer for 10 to 20 minutes. Pass through a fine sieve or muslin again, and leave to cool in a jar or container with a sealed lid. A sterilised jar is great. 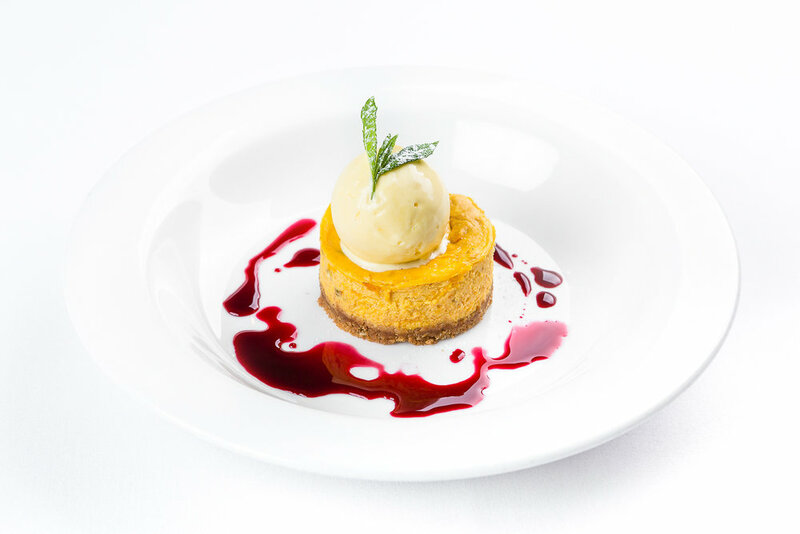 To make the cheesecake, cook the pumpkin flesh in a hot oven for 30 to 40 minutes to ensure its soft. Remove from the oven and turn the heat down to 160°C. Place the pumpkin in a bowl and smash with a whisk until smooth. As it cools, add the crowdie cheese, a pinch of mixed spice and cinnamon, and beat in the egg and sugar. Set to one side. Next, bash the biscuits and seeds until they have a very fine sand texture - use a processor if required. Add the melted butter, a pinch of cinnamon and mixed spice and combine. Oil two 4-inch metal ring and spoon in half the base mixture into each, pressing down firmly. Next, top each base with the cheesecake mix and bake in the oven for 20 minutes, or until just cooked. Allow to cool and be careful when removing the metal rings. Run a small, hot knife round the edge of the cheesecake before attempting to remove the ring. Serve with your favourite ice cream and a trickle of elderberry syrup and crumble any leftover biscuit base over the top and top with a sprig of mint.